I recently had the opportunity to visit Sight & Sound Theatre for a behind the scenes tour sponsored by the Lancaster Chamber. 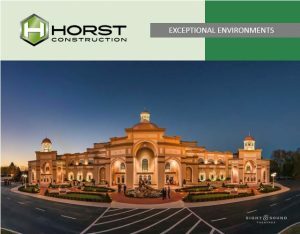 Surprisingly, I had not previously been to the Lancaster County landmark – a fact made all the more grievous by my role as Marketing Manager for Horst Construction, the company who built the 150,000 square foot theatre back in 1998. What I quickly appreciated upon visiting was that photographs cannot do the physical building justice. I knew it would be impressive – I’ve spent the past several years of my career admiring photographs of the buildings that we have on our professional resume, with Sight & Sound being one that always stuck out. But to see it in person was a whole new ballgame. From the moment you pull up to the theatre, you are immersed in the feeling of going back in time. After entering the building, you immediately realize that the attention to detail did not stop with the exterior. The lobby is breathtakingly beautiful, and as the group I toured with joked, even the bathrooms are extraordinary. The auditorium continues this impactful effect, opening to seating for well over 2,000 and a monstrous 300-foot panoramic stage that holds sets four stories tall. The theatre includes a 50’ high pre-engineered building with 40’ high doors, in order to accommodate the extremely large production sets used in the elaborate performances Sight & Sound has become known for. As I soon learned during the tour, what is even more fascinating are the incredible intricacies of what the average guest does not see. A team of designers and craftsmen fabricate all of the sets in an enormous on-site shop. The evolving technology that is part of the show’s special effects includes a revolutionary LED wall that is one of a kind and was specifically designed for the current show, JESUS. I had heard from colleagues at Horst about the elaborate passageways that were devised to allow the live animals to traverse behind the scenes and was still stunned to encounter everything from horses to a camel and even a macaw while visiting. Sight & Sound is a genuinely synergistic effort of people who are passionate about fulfilling their mission. Their footprint on the community extends to 600 employees, in addition to bringing hundreds of thousands of visitors to our county annually. 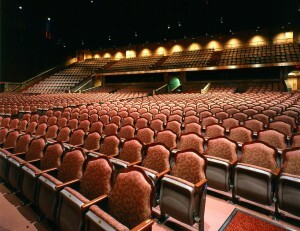 Sight & Sound Theatres has a humble beginning, and a history of trusting God to overcome challenges. After a 1997 fire destroyed the entertainment center originally built to house Sight & Sound, founders Glenn and Shirley Eshelman found the strength and determination to overcome this setback with an even bigger plan for sharing their vision. In a highly collaborative effort, Horst, along with Cornerstone Design Architects and the Sight & Sound team, successfully designed, constructed, and opened the new theatre in only 18 months! 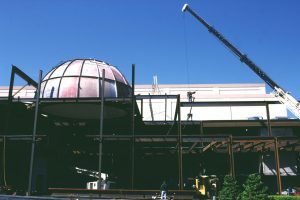 This project was so fast-tracked that performers were holding rehearsals in the auditorium while the structural steel was being placed in the lobby. Hands down, the best part of my job is when I get to visit one of our projects and see it in person. It is always inspiring to talk to our clients and hear about the awesome things they are doing with their buildings. At Horst Construction, we know that a construction project is about so much more than a building. Ultimately, it is about helping our clients to achieve their vision. That is where the true magic happens.